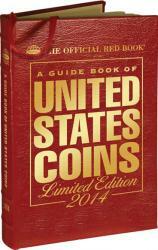 The Official Red Book®—A Guide Book of United States Coins—is 72 years young and going strong. Collectors around the country love the book’s grade-by-grade values, auction records, historical background, detailed specifications, high-resolution photographs, and accurate mintage data. How rare are your coins? How much are they worth? The Red Book tells you, covering everything from early colonial copper tokens to hefty Old West silver dollars and dazzling gold coins. You’ll find 32,500+ prices for more than 7,600 coins, tokens, medals, sets, and other collectibles. You’ll also round out your education in commemoratives, Proof and Mint coins, error coins, Civil War tokens, Confederate coins, private gold, and all the latest National Park quarters, Presidential and Native American dollars, Lincoln cents, and more. Articles on investing, grading coins, and detecting counterfeits will make you a savvy collector; and entertaining essays on the history of American coinage, shipwrecks and hoards, and the modern rare-coin market give you an inside look at “the hobby of kings.” These are just some of the features of the informative, entertaining, invaluable Red Book—the world’s best-selling coin price guide (more than 24 million copies sold). The 72nd edition covers 71 additional new issues compared to the 71st edition, and 15 new coin sets. Mintages have been updated across the board using the latest numismatic research and government data. The 72nd edition continues a section that debuted with the 70th, covering foreign coins that circulated as legal tender in the British American colonies and the early United States. This section includes photographs, history, and pricing for collectible Spanish-American, Dutch, French, and English coins dating from the 1550s to the 1820s. Expansions and updates are also seen in the appendices. The appendix on modern U.S. Mint medals covers more than 40 medals and sets, now including the American Revolution Bicentennial medals, National Wildlife Refuge System centennial medals, silver Presidential medals, and others. As in past years, collectors will benefit from the Red Book’s recent auction records provided for significant rare coins. Listed throughout the charts are nearly 200 notable auction results. Combined with the listed retail prices, the auction data help advanced collectors understand the modern market for high-priced rarities. Red Book coin values are found in the most widely used price guide available today. 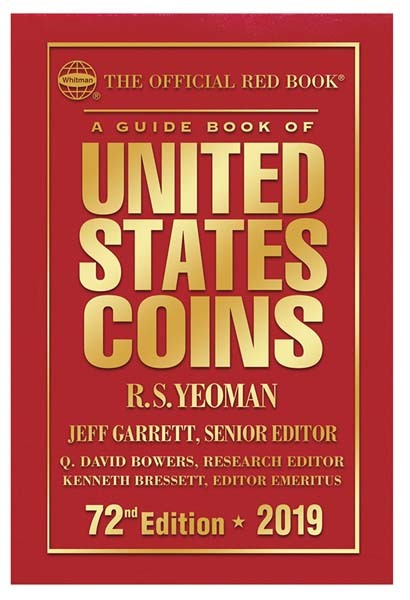 Originally published in 1946 by Whitman Books, A Guide Book of United States Coins: The Official Red Book of U.S. 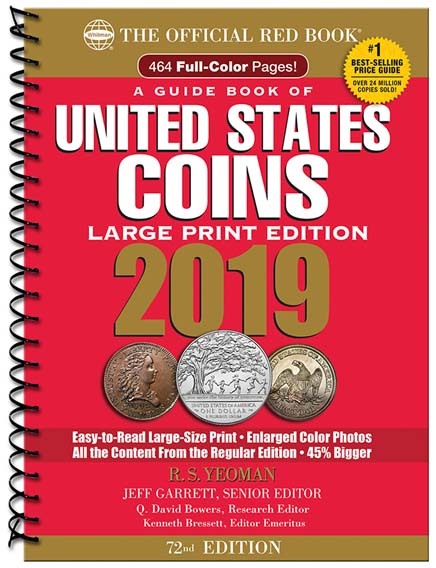 Coins, a.k.a., the Red Book, is the yearly guide that most collectors turn to first for essential information about their coins, including retail pricing. The first Red Book was written by Richard S. Yeoman and current editions are still edited by Kenneth Bressett, a colleague of Yeoman’s who has been working on every edition since 1959. Current Red Books come with full-color photographs and detailed technical information, which help collectors discern and understand the values of their coins. 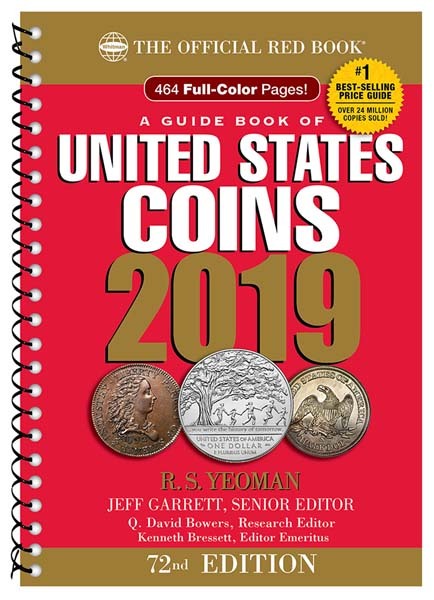 The Red Book is the primary reference guide for coin collectors. 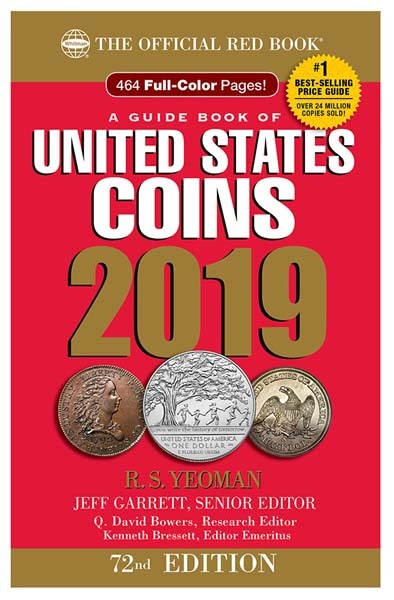 Updated yearly, Red Book coin values also explain the history of certain coins as well as select records for coins sold at auction. The Red Book is an invaluable tool for coin collectors and is still the most significant U.S. coin pricing guide in print today. At WizardCoinSupply.com, we have great prices on the Red Book as well as every other type of coin book and coin pricing guide you might need. If you don’t see what you are looking for, please contact us and a member of our staff will be happy to help you. Also available and for 2019 is the Mega Red Deluxe Edition Redbook.